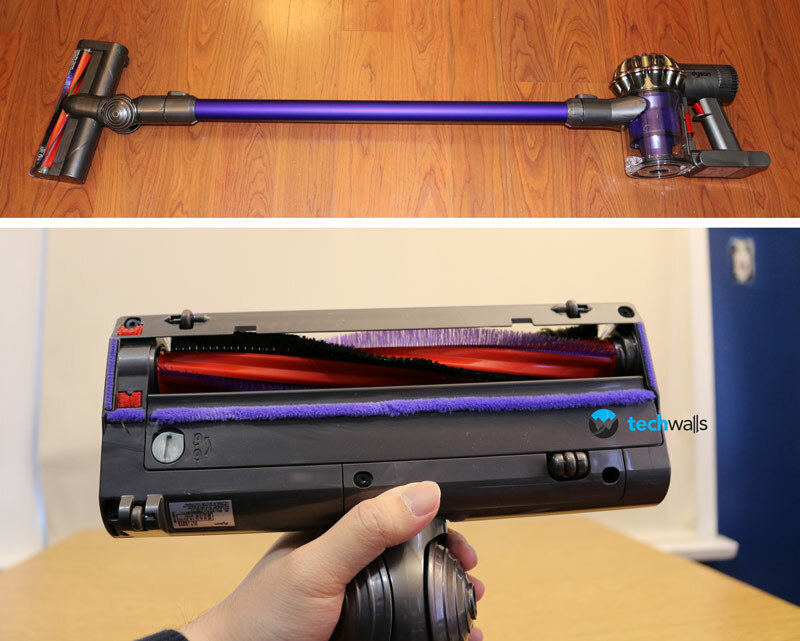 Dyson DC59 Cordless Vacuum Review - Can we forget Corded Vacuums now? 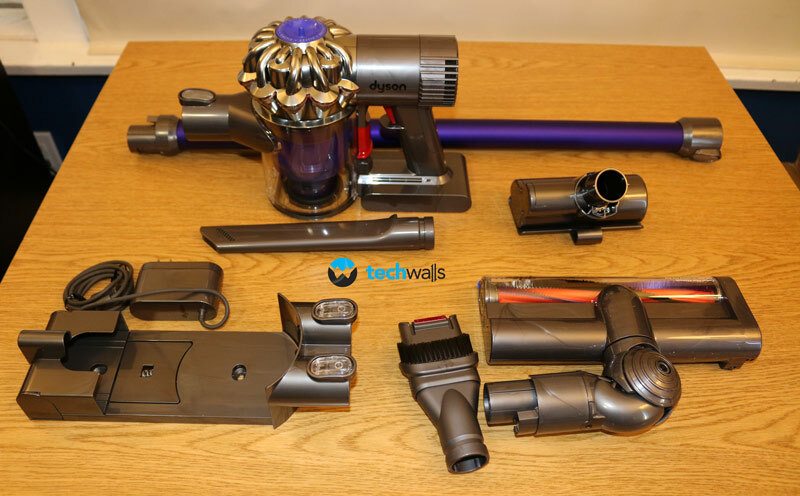 Dyson DC59 Animal Cordless Vacuum Review – Can we forget Corded Vacuums now? I was never a fan of cordless vacuums because they often has a lot of limitations compared to the corded ones. Specifically, they can’t be used for a long period of time, and more importantly, they are not powerful enough. A few months ago, I tried the Electrolux UltraPower Studio, that was a great-looking stick vacuum but it is quite heavy, can’t clean confined or up top spaces and has weak suction power. Therefore, when the Dyson Digital Slim DC59 Animal cordless vacuum was released and promised to solve those issues, I really wanted to give it a try. Now I’ve used the vacuum cleaner for 2 weeks and let’s check out my review below to see if this is how cordless vacuums should be. There is no significant change in design of the new Dyson DC59 compared to its predecessors in the Digital Slim series. It is not easy to distinguish the DC59 with the older Dyson DC44 if you don’t have both of them side by side. The picture below show the handheld vacuum with a bunch of included accessories, including docking station, battery charger, detachable wand, crevice tool, mini motorized tool, combination tool and motorized floor tool. Actually I realize that Dyson made some subtle changes on the DC 59. Its handle is made more forward to improve the balance when you hold the machine. And we can also see that there are now two tiers of cyclones as Dyson increases the number of cyclones to 15 to increase the airflow. Besides, the motorized floor tool is made slimmer and wider to cover larger surface, it is also lighter and comes with a redesigned carbon fiber filaments and nylon bristle strips to improve dust pickup on both carpet and hard floor. When you attach the cleaner head to the included wand, you have a stick vacuum now. Apart from using as a stick vacuum, I love to use the mini motorized head to clean dirt and hair off upholstery. I was unable to clean my sofa with the Electrolux stick vacuum. When it is combined with crevice or combination head to clean tight gaps, my sofa looks perfect right now. The combination and crevice head can also be attached to the wand to reach ceiling, up top or low down spaces. The whole exterior of the DC59 is made of plastic but it is very sturdy. Besides, it will keep the whole unit lighter, now it weighs just 4.6 pounds without attachments. The only complaint I have is that there is no way to store the stick vacuum without its docking station. The vacuum can’t stand upright by itself like others, and it looks so untidy if you put it on the floor. Overall, I really love this design, I can use the vacuum cleaner to clean almost everything, from the floor, under the bed, narrow spaces and upholstery like my sofa or car seats. As stated above, the DC59 comes with 15 cyclones and they feed airflow into the new Dyson digital motor V6. I guess this is the biggest change of the new generation. The 350W motor is said to spin more than 100,000 rounds per minute, more powerful than most handheld vacuums you can find on the market. It means that the vacuum can produce up to 28 air watts (a unit of airflow) and if you turn on the Boost mode, it can reach 100 air watts. It is really amazing as they can pack the great power into a small unit, the suction power is just a little lower than the corded Dyson DC50 (with 128 air watts). In my test, I cleaned my hard floor, my car and my sofa using this machine. You can see in the testing video on top, the motorized mini tool is so effective in removing dirt and hair from my sofa. I almost just need to sweep an area once and there is no dirt left. The same result comes when I used the DC59 as a stick vacuum to clean my wood floor. I didn’t see much on the floor but just after a few minutes, I got a lot of dirt in the collection bin. However, it seems like the vacuum still has some problems catching large debris. The Dyson even did a better job when I clean my car’s carpets. 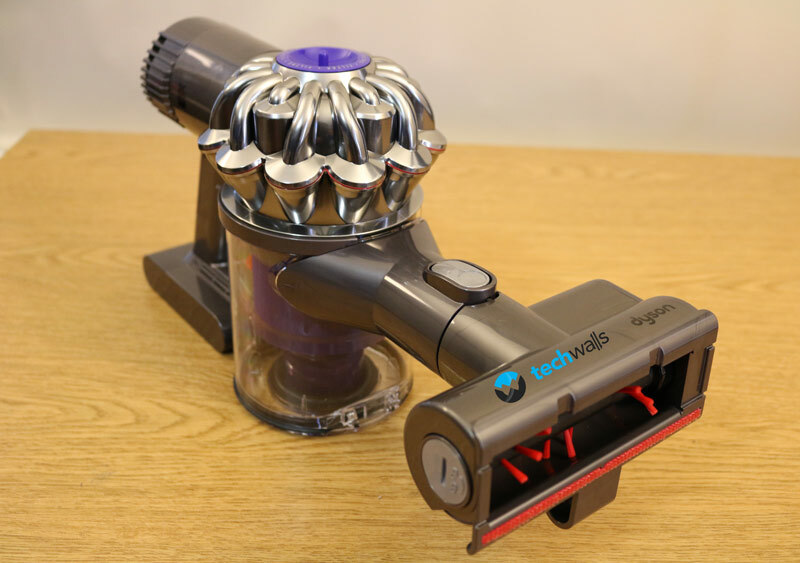 Although the suction power is not as strong as the Electrolux UltraPower Studio, it still can collect more dirt thanks to the new configuration of carbon fiber bristles. In terms of battery life, as I always use it in Boost mode, the DC59 could last around 20 minutes without charging. And you can save the battery more because the vacuum only runs when you hold the trigger. Therefore, it is more than enough to clean my whole 3-room apartment. A full charge will take around 3 hours. Dyson also makes it so easy to empty the collection bin, you will just need to push the red button and all the dirt will be dropped down from the bottom. Just make sure to empty the bin after each use, the wash filter just needs to be washed once or twice every month. Can be used for different cleaning purposes. Suction power is great, even compared to some corded vacuums. The motorized floor tool work great, especially on carpets. Docking station is always required to store the stick vacuum. Do not collect large debris like cereal effectively, particularly on hard floor. Dyson and Apple have a lot in common as they always put a lot of efforts into designing their products. I loved the Dyson Cool AM06 bladeless fan and now the Dyson DC59 is another great example of how a vacuum can become so luxurious. 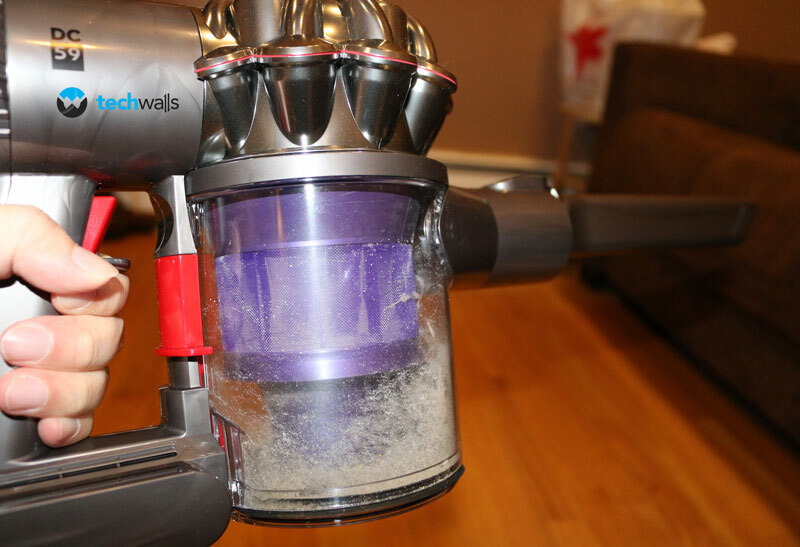 This is undoubtedly the most versatile and well-performing vacuum you can find and it makes your cleaning experience more enjoyable than ever. If you can justify the price of over $350 on Amazon, this is simply the best choice. A very powerful portable vacuum. Wonderful review and wonderful product, But I’m worried about the price of this product although everything is fine. Yes you are right. High price is the only obstacle to buying the Dyson DC59. Its MSRP is $499 but you can buy it for less than $400, anyways it is still quite expensive for a vacuum. Hi I love this Dc 59 but sorry to say the battery runs out to quick fo my needs so I’ve purchased another battery and the attachment I would need to remove the battery, I’m just hopping its not going to be hard to change over battery’s can you help with this, maybe a quick video on you tube maybe !!!! How easy is it to change the battery? ?